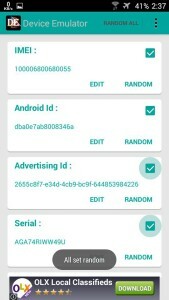 hey guys, Device Emulator is a new android privacy guard app, Which is giving a Great Competition to other Privacy Apps Like Xprivacy. This is the new app, in Android Operating System, which is run in Rooted Android Phones with the help of Xposed framework. 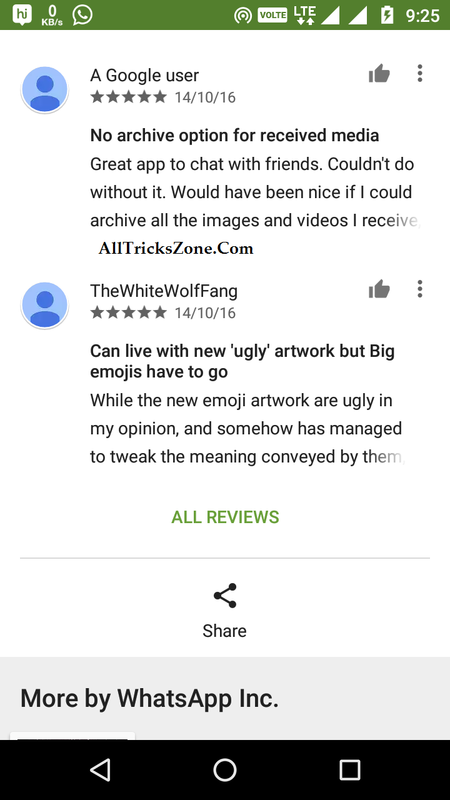 And one more thing As you all know, There are millions of Android apps available on Google Play Store But, Unfortunately These apps takes our Device’s Identification Data and some of them sells our device identity to other companies. So these Android Privacy Guards are Designed for Hide your Devices Privacy from Apps. This Device Emulator app can hide your phone’s identification from any other app. and this app let them get any other random IMEI, and other Values of your Phone. So you must checkout for more about this app now from below. Have a simple look on Network Spoofer app for make fun of your friends with their internet. One Click to change all the Value, no need to enter all value one by one. 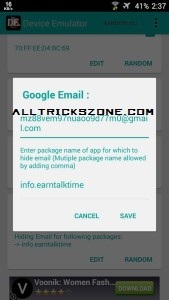 Also See – Easy Way to get paid apps for free from Play store. Firstly, make sure your phone is already rooted, and you have installed Xposed, and Device Emulator app from Above link. After the Restart your Device phone, Open Device Emulator app, and Select option of Random all like Screenshot, and also tick on all Things which want to hide or snoof from apps. i recommend you to tick all of the options. Then, Scroll Down at the app and you will see option of Gmail, click on option from there, and Simply Enter Package name of the app from your device which you want to Snoof identity. Now when you entered the Package Name of the app simply click on Save Option, and now install and open app, which you want to Snoof and hide your devices identity from app and your work has been done. Yeah now this app will not able to get your device’s Identification and you don’t need to worry about anything. Firstly, Open that app in play store which you want to get Apk Package name and Select Share option from there. Now Share link via Whatsapp or text, and you will see the link, in last of the link, just after the “id=HerePackageName” you will see Package name of the app like below. So Guys this was the quick and very easy way, for checking the package name of any app. Note | Disclaimer: – This app is really not Created for use illegal Use / Purpose. This is just created for hide Phone’s Identification from several Apps for security reasons. Yeah.!! Guys, this was the new latest app for snoofing IMEI, Mac Address, Gmail and much more value from a single app. This app requires root and xposed app to be installed in your android device. If you don’t know what is root, then i suggest you to don’t follow this easy Guide and first Read or research on What is Root in smartphones after that follow the above easy step by step procedure to Use Device Emulator. So, if you have any other issues while following this guide then feel free to comment in below section.. I’m here to help you out in any matter. thanks for connecting with us keep visit for more tricks like this. You can also Download Device Emulator apk from above.